Recently, Noelie of Noelie's Nails started her own line of polishes, Smitten Polish, and my are they lovely! Have a look at the two I picked up, Bluebird and Hydrangea. Bluebird is a taupe-y chocolate with bright ocean blue and holographic teal glitters, and does it ever sparkle! I really love this unique color combination, and this is actually my first brown polish. It applied very well; it only needed two coats and the glitter was quite smooth even before a topcoat. In the sun you can really see the rainbow teal glitter sparkle! This polish is so beautiful and easy to wear. It matches well with everything! 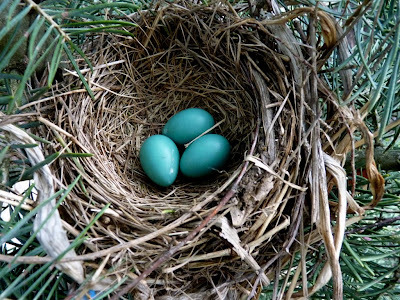 Although, the colors remind me more of a robin's eggs in its nest than a bluebird. 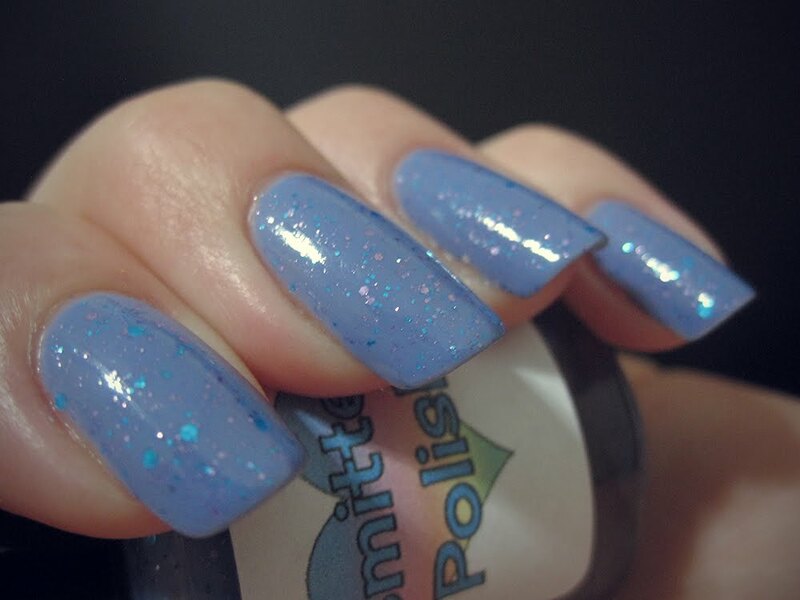 Next up is Hydrangea, a gorgeous periwinkle with lavender and ocean blue glitters. Since I'm fairly obsessed with anything purple, particularly hydrangeas, it was truly a must-have. Now that we have a home with a lawn I hope to have my own purple, pink, and blue hydrangeas someday soon! Hydrangea also had a wonderful formula that smoothed out very well. Here I've layered it over Essie's Lapis of Luxury, which matches the base perfectly, though it would have been opaque (and probably a bit more glittery) in three coats. I love how mattifying glitters makes them look entirely different and causes the glitter to really stand out. With a matte topcoat, Hydrangea looks even more ethereal (and sparkly!). So far, my only complaint is that I did get some tip-wear and chipping after two days of wear, which I personally don't mind since I usually change my nail polish that often anyhow. I would definitely recommend Smitten Polishes to glitter lovers. Noelie has a wonderful selection of beautiful, well-made and unique polishes, and I can't wait to see what other creations she has in store!